I just finished Columbine by Dave Cullen and the reviews praising this book were right on the mark. As soon as I heard about this book I knew I wanted to read it. I always seem to be drawn to tragic stories and Columbine was no exception. I also think part of the lure comes from the fact that the shooting occurred while I myself was in high school. I remember being shocked, but more so I remember how scared the administration seemed to be. Immediately afterwards a zero tolerance policy went into effect No longer were kids allowed to jest about violence, which of course, us being high school kids, only led to more jokes. Everyone’s concerns were repeatedly reinforced because after Columbine the media reported on nearly every school shooting, some close to home. To this day I plan exit strategies in case the building I’m in comes under attack; most rooms seem to offer no safe escape. To be fair, I also strategize escape routes for possible zombie attacks. I assure you this is as far as my paranoia extends. "Ten years in the making and a masterpiece of reportage, "Columbine" is an award-winning journalist's definitive account of one of the most shocking massacres in American history. It is driven by two questions: what drove these killers, and what did they do to this town? On April 20, 1999, two boys left an indelible stamp on the American psyche. Their goal was simple: to blow up their school, Oklahoma City-style, and to leave a lasting impression on the world. Their bombs failed, but the ensuing shooting defined a new era of school violence--irrevocably branding every subsequent shooting 'another Columbine. I’m always cautious about reading books based on a gruesome tragedy because you never know what you’re going to get. Some authors set out exploit people’s morbid curiosities and others seek to help people understand. This book falls into the latter category. 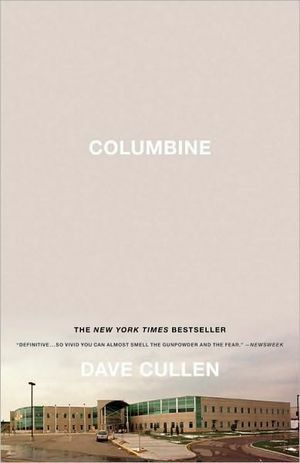 Cullen took on an ambitious task when he endeavored to tell this story and the result was a tasteful portrayal that helped clear up many of the misperceptions surrounding Columbine. I myself was stunned at how little I actually knew about what occurred. Like many people I believed that two teenage outcasts wearing trench coats simply snapped one day and planned their revenge on the student body of their perceived tormentors. None of this is even remotely true. Cullen demonstrates, based on a plethora of evidence from police investigations, FBI profilers, and the killers own journals, that these teenagers were not loners, they did not have an agenda retaliate against the jocks, nor did they snap. Instead, they were egotistical boys who believed that the human race is comprised of idiotic sheep who need to be destroyed. Parts of the book had a greater impact on me than others. First, when I pictured what happened I never considered the sensory overload the students were bombarded with. Not only were the murderers shooting victims, but they were also detonating home made bombs throughout the school, which led to thick smoke filling the air and setting off deafening sound of the school’s fire alarm. I was also unaware of how little time actually lapsed during their rampage. Secondly, I have always had mixed feelings towards the killer’s parents. Initially, I believed the parents were to blame and I stereotyped them as uninvolved and negligent. Now, however, I am more cautious about making that proclamation because they seemed like average parents who were just unfortunate enough to have monsters as kids. In short, I highly recommend this book to anyone who is interested in learning more about one of our nation’s greatest tragedies. That being said, this was a hard read that brought me to tears on numerous occasions. My husband doesn’t understand why I read books that have such an effect on me and my answer is always the same: If people can survive such horrors, the least I can do is learn about their struggles and remember.